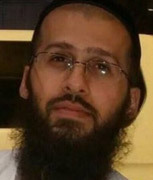 Nov 19, 2015 - Rabbi Aharon Yesayev, 32, of Holon was killed in a stabbing attack during afternoon prayers in the Panorama building - a commercial center in southern Tel Aviv. The attack took place on Thursday afternoon in the Panorama office building at an entrance to a room used for prayer services next to the parking lot. In the middle of the afternoon prayers, a man fell wounded at the entrance to the synagogue. Behind him was aman with a knife trying to get inside. As some of the worshipers tried to assist the injured man, the rest quickly closed the doors to the room. Two people were killed in the attack: Rabbi Aharon Yesayev and Reuven Aviram. Aharon Yesayev worked in the Sakal electronics store in the Panorama center, and went upstairs to complete the 'minyan' of ten worshipers for the afternoon prayers, when he was killed. Yesayev was born in Tel Aviv. He served in the army. After he became religiously observant several years ago, he moved to Holon. He was married and the father of five children - the oldest, a daughter, in first grade, and the youngest just four months old. Rabbi Aharon Yesayev was buried in Holon. He is survived by his wife and five children, parents and siblings.